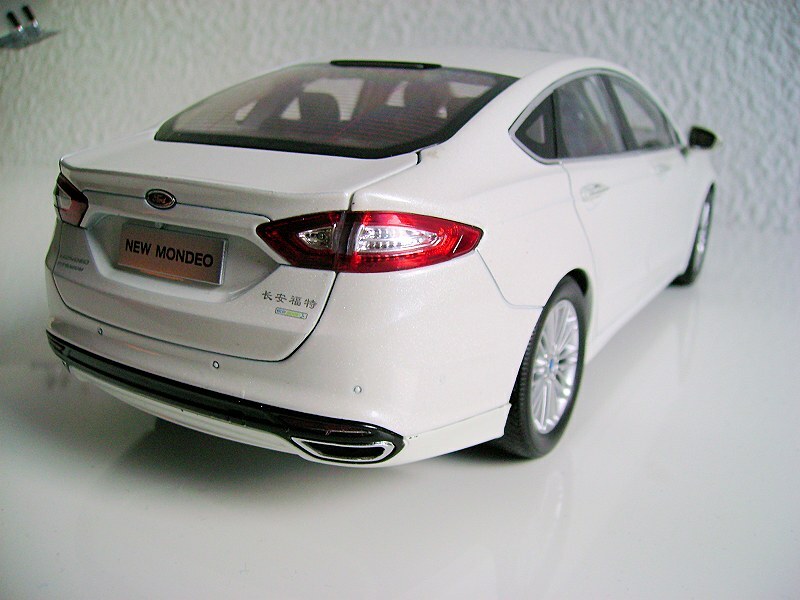 Go further: The Chinese dealership model of the Fusion/Mondeo in 1/18. 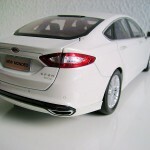 As yet, Ford have gone further with their good-looking Fusion/Mondeo outside Europe. This tasty tidbit with its Aston Martin grille and Maserati taillights was first launched as the Fusion in North America and is even sold in China, but is only now about to arrive in European showrooms. 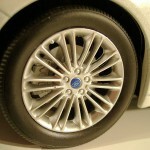 Ford China have also gone further in terms of dealership models. 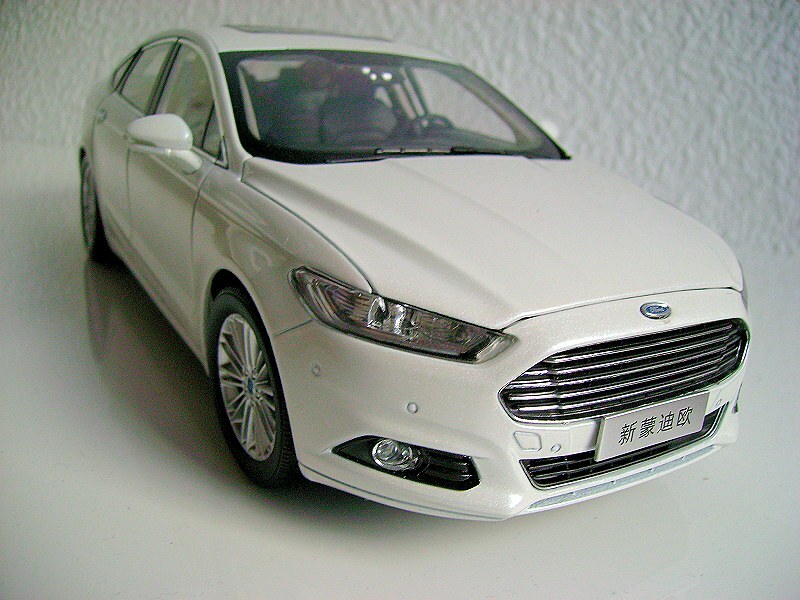 Like Mercedes, BMW and others, Ford China sell models of their contemporary cars. 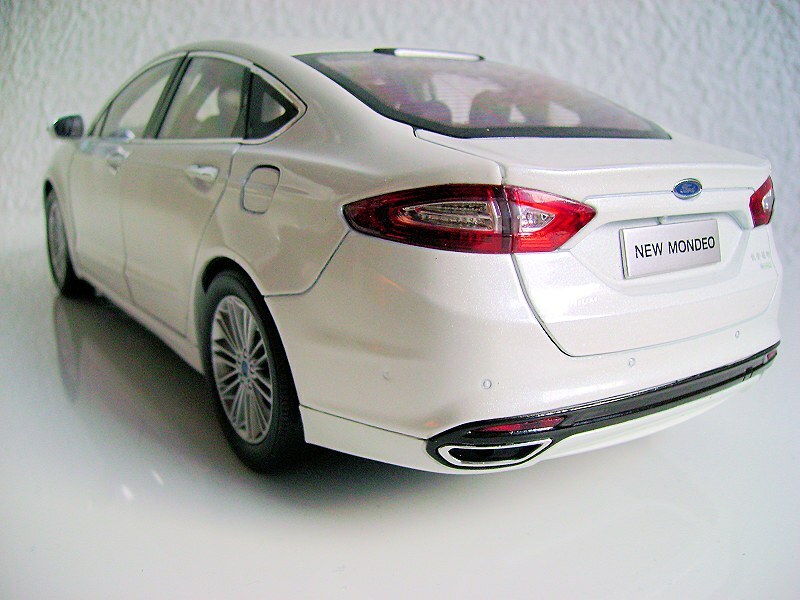 Now they even have models of the Mondeo (as it´s globally known outside North America, hence the name) exclusively built for them. Even the heavy box conveys a certain exclusiveness. Small wonder, as inside is nothing less than the top of the range “Titanium”, clad in Ford’s most expensive white metallic paint, chrome applications, an apparently big petrol engine, as the stylish double exhaust pipes and the “Ecoboost” badge at the rear reveal, a sunroof, electrically adjustable leather seats and other extras like parking sensors, rear camera and sensors behind the windscreen that you’ll notice upon closer scrutiny. The heavy weight is caused by the metal bottom plate of the model. The lines and stance of the car have been captured wonderfully. Especially where front apron and rear valance meet the fenders are reproduced correctly. Chrome around the windows, in the charismatic grille, and at fog lights and exhausts is a shiny finish; on the door handles it´s only printed on, therefore less shiny and all-too-easily rubbed off. The white metallic paint is literally brilliant. The problem with metallic paint effects on models often is that the metallic flakes are too big. Not on this model. On some sharp edges and in notches the paint job is less than perfect. However, as always white paint mercilessly reveals imperfect shutlines, especially around the trunk. That the latter opens on doglegs is not the modelers’ fault, but as true to the original as the telescopic struts that keep the hood open to reveal the engine, that is covered up and only has a few colorful dots in the dipstick, fluid tanks and battery stickers. 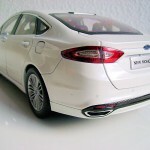 Both on the rear and front the Ford badge is replicated three-dimensionally, not just printed on like the “Mondeo”, “Titanium” and “Ecoboost” scripts on the trunk. Fog lights and taillights have better depth and detailing than the headlights. 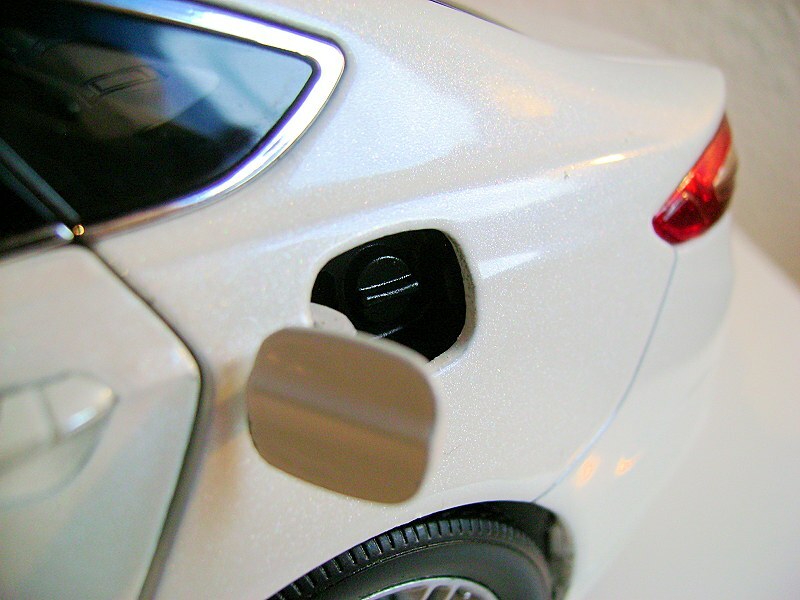 Instead of conveying a touch of high-end value, the gaps in the shutlines of the opening fuel lid spoil the car’s lines a bit. 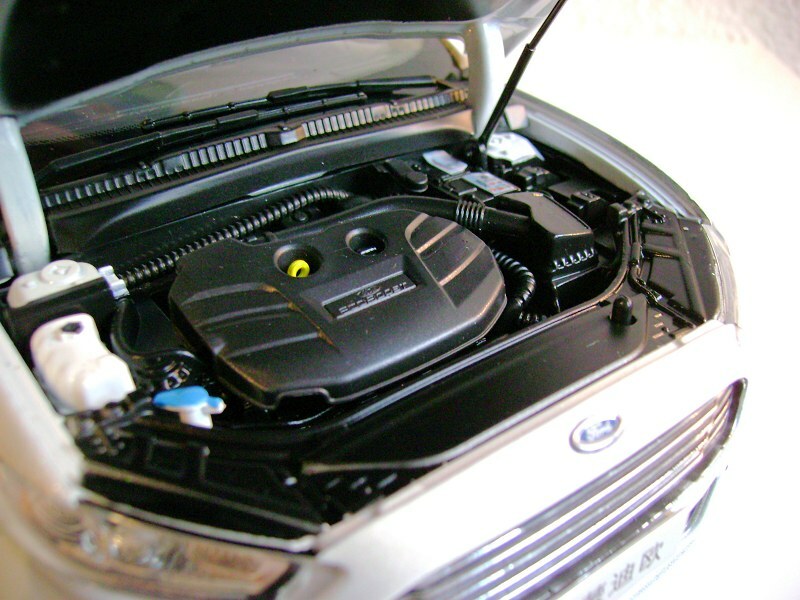 Additionally, there is a fuel cap instead of Ford’s capless Easy-Fuel-nozzle. So the lid would have better kept sealed. Thankfully, the folding wing mirrors don’t reveal this function visibly. The rims are nice and even have air valves. 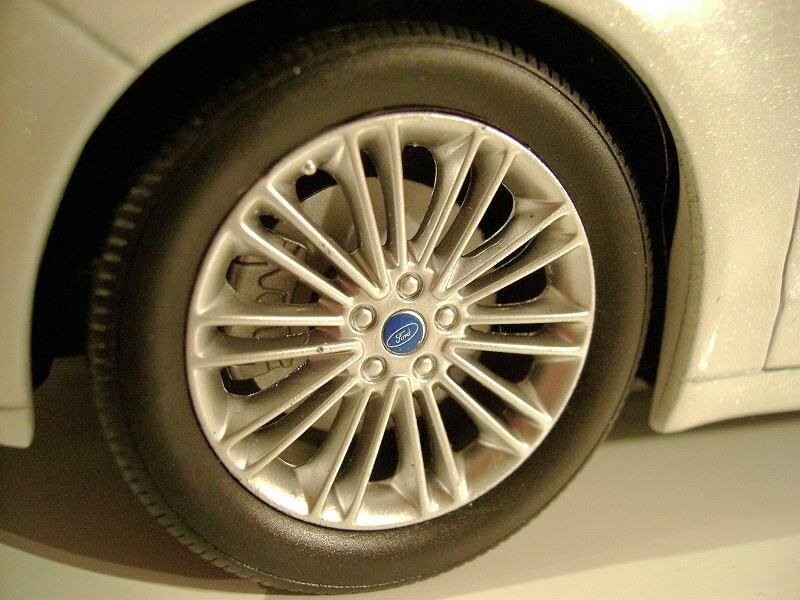 As usual with models for the Chinese market, the brakes are a weak point. A lot more effort has gone into the model´s interior: There’s thick carpeting like in the trunk, the leather stitching has been contoured into seats, headrests and armrests, and meticulous attention to detail has gone into replicating every single button. Of course, textile safety belts with photo-etched buckles complete the picture. 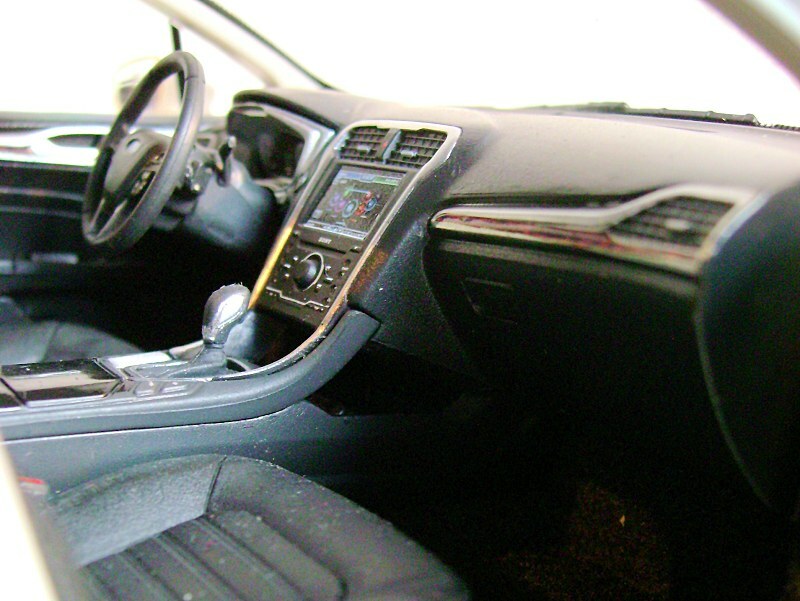 The sunroof opens and an additional sun shade slides back and forth like in Kyosho’s Rolls Royce Ghost. 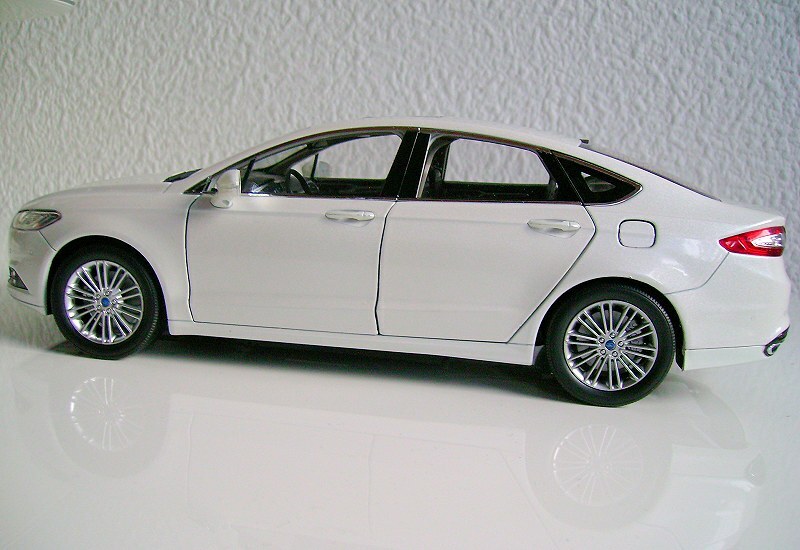 It’s a pity that this nice model is unavailable outside China (it is through eBay, though). 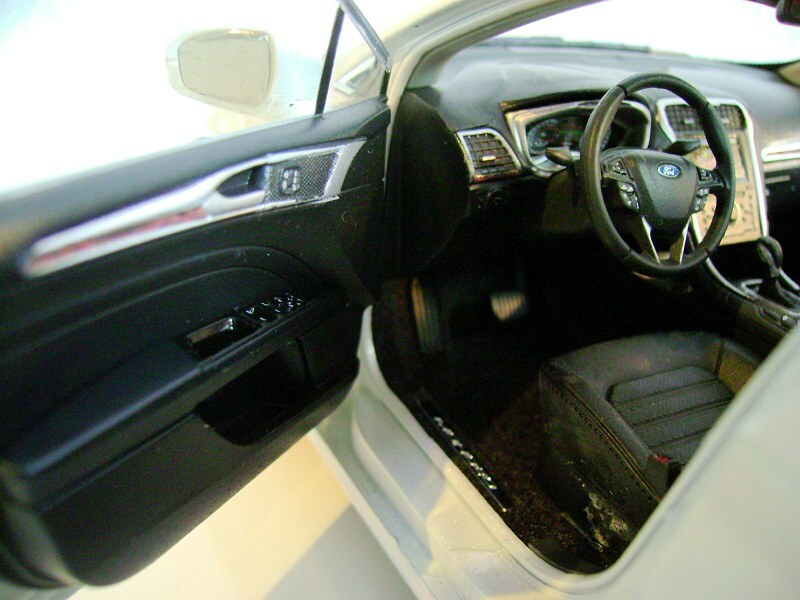 1 Response to "REVIEW: China Ford Fusion/Mondeo"
Did you notice the driver´s seat? It has been sent back now!